"Lord Caitanya is the ideal teacher of life's prime necessities. 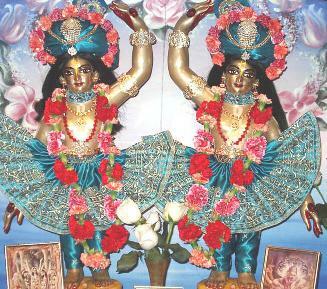 He is the most munificent bestower of love of Krsna. He is the complete reservoir of all mercies and good fortune. As confirmed in Srimad-Bhagavatam, Bhagavad-gita, Mahabharata and the Upanisads, He is the Supreme Personality of Godhead, Krsna Himself, and He is worshipable by everyone in this age of disagreement. Everyone can join in His sankirtana movement. No previous qualification is necessary. Just by following His teachings, anyone can become a perfect human being. If one is fortunate enough to be attracted by His features, one is sure to be successful in one's life mission. In other words, those who are interested in attaining spiritual existence can be easily relieved from the clutches of maya by the grace of Lord Caitanya."